If you haven’t heard of Seaway yet, you’re about to! We first caught the band opening for Sorority Noise and Knuckle Puck almost a year ago and we’ve been hooked on their catchy pop punk tunes ever since. Singer Ryan Locke, guitarist/vocalist Patrick Carleton, guitarist Andrew Eichinger, bassist Adam Shoji, and drummer Ken Taylor have perfected the art of crafting hook filled songs like “Slam”, “Airhead”, and “Trick (So Sweet)” that you can’t help but sing along to! They also put on a super fun, high energy live show that is not to be missed. Hailing from Ontario, Canada, Seaway are currently on tour with fellow Canucks, Simple Plan in honor of the 15th Anniversary of “No Pads No Helmets…Just Balls.” The tour officially kicked off in Florida last week and includes a stop in NYC on Saturday at Playstation Theater. We can’t wait to hear them play their massive debut album front to back. Catch us in the pit raging like our 13-year old selves would have wanted! We had the chance to talk with Seaway guitarist Andrew Eichinger about what’s on their tour rider, and what to expect from the next Seaway album. Read our interview with Andrew below! SecretFangirls.com: You just kicked off the Simple Plan “No Pads No Helmets Just Balls” 15th Anniversary Tour for such an iconic pop punk album. What are you looking forward to most on this tour? Andrew Eichinger: We’re really looking forward to playing in front of a ton of new people and doing our best to win them over. But it will also be very cool to see Simple Plan play that album front to back. Being from Canada, it was such a huge record for us when we were like 9/10 years old, so to be on this tour is one of those full circle moments for us and we’re super excited. How would you describe a Seaway show in 3 words for those who haven’t seen you live before? Not really. We’re pretty boring honestly. Usually just have a couple suds. What artist have you or would you totally fangirl over if you met? Shania Twain or Alanis Morissette. The nostalgia is in full force with your album “Colour Blind” from the art to the sound. What artists are your biggest influences as a band? I think late 90’s / early 2000’s pop punk bands like Blink, Sum 41, New Found Glory and even Simple Plan are the obvious ones on that record because that’s the stuff that we grew up on. But we’re influenced by all kinds of different artists and bands on the pop and rock side of things that come out a little on Colour Blind and will continue to, on our next record. You’ve been teasing photos from the studio lately, what can fans expect from a new Seaway album? It’s hard to say right now but based on the songs we have it will be a natural progression from everything we’ve done in the past, but there will definitely be some new twists and turns in there as well. Shout out to the fans who are spending a little more than usual to come see us on this tour. It means a lot to us to have our fans there wildin out while we play in front of a sea of people that haven’t heard us before. Catch Seaway on tour with Set It Off and Simple Plan on the “No Pads No Helmets…Just Balls” 15th Anniversary Tour! Grab a copy of “Colour Blind” on iTunes or Amazon so you can sing along on tour! Be sure to follow Seaway and Secret Fangirls on Twitter for more from your new favorite artists. Changing things up for this week’s Friday Five! This week we’re looking at our favorite tennis players. If there is anything we like more than music, it’s tennis. We’ve previously discussed how tennis is the ultimate fangirl sport. Not only are these athletes extremely fit and excellent at what they do, but it seems like there is a requirement to be good looking to play in the ATP tournaments. Here is another player with a really beautiful backhand (yes, backhand…..that’s all we’re implying….no innuendos here!!) Gasquet is French and plays the sport with an elegant flair. Simply put, he’s just a beautiful player to watch. When he gets frustrated, he throws his sweaty socks on the court because he can. (At least he’s not smashing racquets?) Sadly he doesn’t use Instagram as much as Dimitrov. “For me, it will be a tough match for sure, no?” Rafa is so humble about his game, even in first round matches where he is sure to bagel his opponents. Rafa always fights his hardest and plays like it’s the final of a grand slam. He also gives the best acceptance speeches and press conferences, for sure. And then there’s that Armani commercial where he just takes off his suit and puts on some jeans, because why not, no? This kid is the next Andy Roddick, at least we think he has the potential! He needs to bring Andy back to be his coach (but it seems like Ryan is taking cues from Andy already). 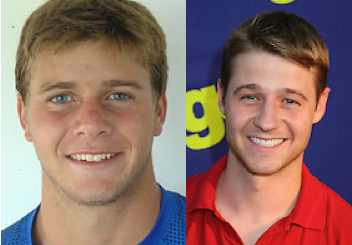 It also kind of freaks us out how much Harrison looks like Ryan Atwood from The O.C., or as We like to call him, Chino. Can you tell who’s who? JOOHNNYYYY!!! At nearly 6’10”, we love that he plays tennis and didn’t go into basketball. John is super loveable and watching him play is always a joy, even during stressful tie-breakers. Which he tends to play. A lot. During on court interviews, he literally dwarfs any other player and interviewer. 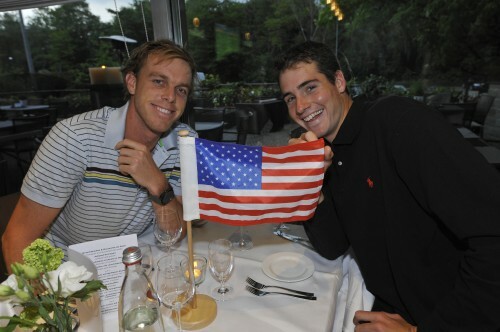 We love when he teams up with fellow American & BFF Sam Querrey for doubles! Go Quisner! The Monte-Carlo Rolex Masters is happening right now – visit ATP World Tour for the latest scores, news & updates on your favorite players. AJR Summer 2014 Tour Dates! Are you ready for AJR? The band, comprised of brothers Adam, Jack and Ryan Met, has quickly gained momentum since their single “I’m Ready” was released last fall. The video recently passed 1 million views on Youtube! The song has since entered radio rotation around the country, and doesn’t look like it’s slowing down any time soon. It’s impossible to hear this song and not clap along! AJR will be playing the 106.1 BLI Summer Jam with artists like Austin Mahone, Jason Derulo, and Cody Simpson on June 1st at Nikon Jones Beach Theatre, as well as a few other radio shows around the country. You can also see AJR opening for Lindsey Stirling on her summer tour! Check out all the dates below! Can’t wait for summer? You can see AJR in Philadelphia this Saturday, April 19th, at World Cafe Live, and in Los Angeles on Tuesday, April 22nd. Get your tickets now! Be sure to follow AJR & Secret Fangirls on Twitter for more updates! Pickup a copy of the “I’m Ready” EP on iTunes or Amazon! Haven’t you always wanted to ask an artist the story behind your favorite song? Dan + Shay released the newest addition in their “Story + Song” series, and explained the surprising inspiration for the title of “Stop Drop + Roll.” Goes to show that inspiration can strike anywhere, anytime! Grab a copy of the duo’s smash debut album “Where It All Began” on iTunes and Amazon now! Make sure you follow Dan+Shay and Secret Fangirls on Twitter for the latest news. The Vamps Debut Album “Meet The Vamps” is Out Now! The Vamps highly anticipated debut album “Meet The Vamps” is out now in the UK and Europe! We have heard snippets of all of the songs and we have to say, this album is going to be huge. When we saw The Vamps in NYC at Gramercy Theatre, they blew us away with their new songs featured on the album. Watch “Girls On TV” Live from Gramercy Theatre below! We are still waiting on a US release date for the album, but we’re hoping it will be sometime this summer to go along with The Vamps tour with Austin Mahone! The album will be out April 25th in Australia and New Zealand, and May 21st in Japan. To celebrate “Meet the Vamps” release, the band will be having several meet & greets, performances and signings around Europe. Check here for details on how you can Meet The Vamps! Check out the brand new lyric video for “Somebody To You” below.